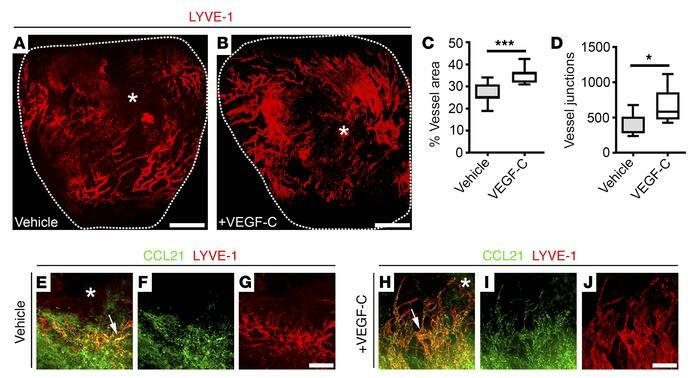 VEGF-C treatment augments cardiac lymphangiogenesis after injury. (A and B) Whole-mount immunostaining for LYVE-1 (red) to visualize the subepicardial lymphatic plexus of vehicle- and recombinant VEGF-C(C156S)–treated hearts on day 7 after MI. (C and D) Quantification of the lymphangiogenic response on day 7 after MI as percent LYVE-1+ lymphatic vessel area (C) and junction number (D). Data are presented as mean ± SEM; vehicle, n = 7 hearts; VEGF-C, n = 5 hearts. Significant differences were calculated using an unpaired, 2-tailed Student’s t test (*P ≤ 0.05, ***P ≤ 0.001). (E–J) Immunostaining for CCL21 (green) and LYVE-1 (red) in vehicle- (E–G) and recombinant VEGF-C(C156S)–treated (H–J) whole adult hearts on day 7 after MI. White arrows highlight expression of the immune cell chemoattractant cue CCL21 by lymphatic capillaries after injury. White asterisks indicate the ligating suture. Scale bars: A and B, 1 mm; G and J, 20 μm.